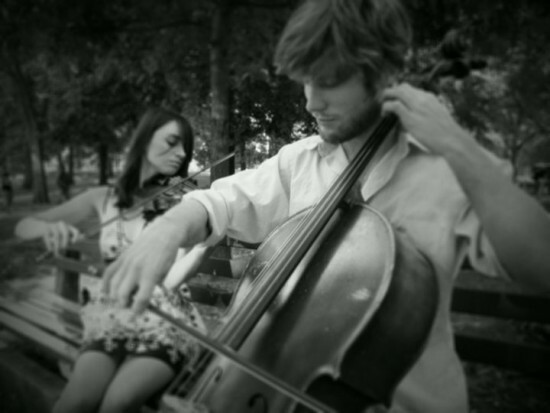 Driftwood Strings is a group of dynamic, conservatory-trained musicians based in Philadelphia, Pennsylvania. 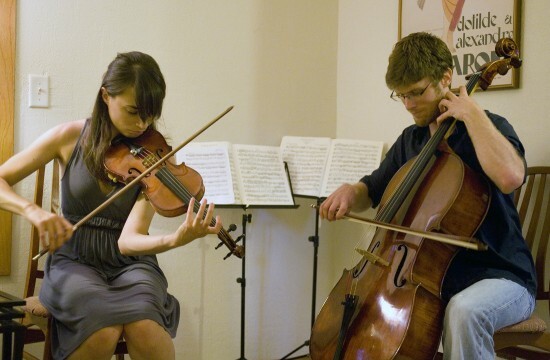 Founded as a duet in 2010 by violinist Rachel Massey and cellist Daniel Hawkins, Driftwood collaborates with top musicians in the Philadelphia area to offer trios, quartets, and quintets customized to the size of your event. Driftwood has performed at New England Conservatory's Jordan Hall, as well as for weddings, receptions, and other special events across New England, New York, New Jersey, Virginia, and the Midwest. Rachel from Driftwood was great to work with and I would highly recommend them. We needed a cellist for our very small, family-only wedding ceremony and they provided a great, professional musician who did everything we asked and was very easy to work with. I would highly recommend working with Driftwood, regardless of what size event you are hosting. Daniel and Rachel played for our wedding ceremony and cocktail hour. We chose classical arrangements for our ceremony and a variety of pop songs for our cocktail hour. My husband and I were truly impressed with how perfect the music was. Our wedding guests are still commenting to us about how fun it was to hear their favorite pop song played on strings. Daniel and Rachel even played along while my mother in law serenaded our guests with an impromptu solo! 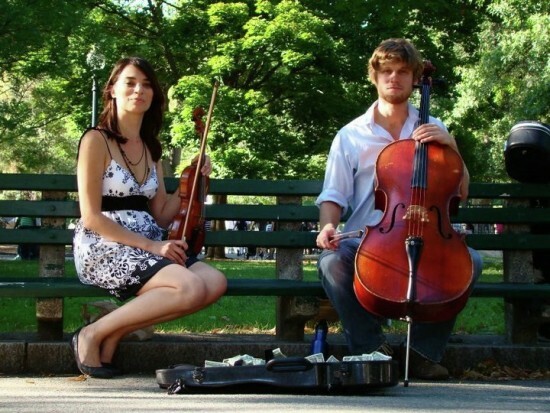 Daniel and Rachel are so talented and we feel so lucky that they were available to play for our wedding day. Daniel is very easy to communicate with and was flexible to any changes I made in the music selection. We hope to hear them play again soon and give our highest recommendations. I could not be happier. This was my daughter's wedding, and having Driftwood Duets play was a gift to her and myself. The music added even more joy to my heart, and they were fun and easy to work with, and of course the music was professional and so very well done! Book Them! Truly Talented & Professional Musicians! Daniel (cellist) and Rachel (violinist) were phenomenal at my Valentine's Day wedding ceremony. I cannot recommend them enough. I worked with Daniel to set-up the "gig" and found him extremely responsive and eager to please. Not only are Driftwood's prices fair but they also allowed me to have custom songs - I chose a very random piece (Daylight by Matt & Kim) and they nailed it!! Daniel made booking my event a breeze, they showed up on-time and their music came across beautifully at my venue. I could not be happier. They truly enhanced the atmosphere of my wedding ceremony & were worth every penny. Thank you both! varied selection, well-prepared, well-rehearsed and very talented; charming too! We hosted Driftwood at a neighborhood Holiday party and everyone loved the music. It was nice having a live performance as apposed to background music playing. It was a delight to have Rachael & Daniel in our home. Perfect for a wedding ceremony. I used Daniel and Rachel for my wedding, they were amazing. I got so many compliments on how beautiful they sounded. They even learned a new song for my bridesmaids and groomsmen to walk down the isle to. It was Led Zeppelin's "All of my Love". After the ceremony it's all any of our guests could talk about. I would most certainly recommend them to anyone who is getting married. I could not have asked for a better set of musicians. They were also very reasonably priced. I definitely got my money's worth. I also recommended them to friends or ours who's wedding we were in on 8/31/2013 in Rhode Island. They were yet again perfect and even learned new songs for their wedding. This duo was amazing, would love to work with them again. I would highly recommend Rachel and Daniel to anyone. They were so easy to work with, so incredibly talented and just good people in general. I'd love to hear more of them and given the chance, I'd love to work with them again. I can't say enough good things about them. Their music is beautiful. So Incredible for our Wedding!! Rachel was extremely responsive when setting this up, and she was great with logistics. I was so busy when the duo arrived that I did not have time to talk with them, and it was amazing that they set up, played for the guests as discussed, queued the correct songs at the correct time, and learned new pieces for us as requested with no interaction. Besides the incredible professionalism they displayed, they sounded even better. It was surreal how good they sounded. Guests at my wedding made comments how great they were. When I finally did get to talk to them after the wedding, Rachel was a sweetheart... The other muscian as well. A rediculously great memory! Beautiful Strings a Highlight of Our Wedding Reception! Daniel and Rachel made our recent wedding reception so special. We had our event at the Institute for Contemporary Art in Boston, and we really wanted strings to accompany my wife’s entrance, our cocktail hour, and the early part of the dinner service. We had to switch rooms and change the tone of the music rather quickly sometimes. But Daniel and Rachel were beyond accommodating with all these requests, even as we inconveniently changed our preferences at the last minute! We initially found them online because we knew that we wanted classical music on strings. But we also wanted to incorporate some of our tastes for more recent indie rock and pop and were wondering if anyone did string interpretations of these types of songs. Daniel and Rachel not only had an amazing classical repertoire, but they also took all of our added requests for songs (including Radiohead, the Flaming Lips, and the Smiths) not on their playlist. Their arrangements of our requested songs were absolutely beautiful, as were all the songs they played. I was really impressed by how they could switch between genres really easily without it sounding abrupt; the transitions between songs were seamless. My wife said she’ll never forget walking into their music, and we only wish that we booked them to play longer at the event. In the days and weeks that have followed, our friends and family have complimented us so many times about how lovely the string music was. We would hire Daniel and Rachel again in a split-second, and we hope our friends book them for events so we can hear them play again. Thank you both for a truly wonderful evening. We hired Driftwood to play during our wedding ceremony and cocktail hour at our outdoor wedding this past August. They were so easy to work with, and the music they played was truly beautiful. We were so busy on the day of the wedding we didn't have a chance to go over any last minute details, but Driftwood handled everything like true professionals. We had chosen a few songs for them to play during our ceremony, and left the rest of the music up to their discretion. They picked a great assortment of music to play and we received many compliments on how lovely their sound was. I can't recommend them highly enough. They are talented, professional and very easy to work with. Their music is wonderful and they add so much to an event. I would recommend you use Driftwood for any event you are holding. Thank you, Stephen! It was a pleasure being a part of your daughter's big day. Congratulations and all the best to the newly weds for many wonderful years to come! Beautiful day, even more beautiful music! Thank you, thank you, THANK YOU! Your performance at our wedding last night was spectacular. It was one of the highlights. The only thing I wasn't happy with was that I didn't have you stay the entire evening. Your beautiful music was dearly missed when you went home. EVERYONE raved about you and asked, "Where did you find them?!". I hired Daniel and Rachel for my proposal. I myself was a bit frantic in the setup (had to change contract details a few times and location last minute), but Daniel kept open and clear communication. Daniel and Rachel planned ahead for inclement weather and showed up earlier than required - this was comforting and especially important as it was a surprise proposal. The music and performance was amazing, and really made the occasion. At first I was worried that having a duo instead of a quartet would lose the fullness of the performance, but it was actually more intimate and really great. They fulfilled my pop musical selections, and it was elegant and wonderful. Can't say enough about how amazing Rachel (lead violinist) was throughout the whole process! She worked with us to get the music selections just right and answer any question very responsively. During the performance, she and cellist Veronica played amazingly, including really nailing our special request of the Moonlight Sonata and playing Air on a G string just softly enough during our vows to not be a distraction but loudly enough that we felt like we were in a movie. Perfect! Thank you so much! Oh, and on top of everything we were on lockdown at MIT the day before our wedding, but they came to our rehearsal anyways as planned and did a stellar job. So brave and supportive of you! Thank you so much! We wish you many more years of success and beautiful music! Thank you, Cherie! It was such a pleasure working with you from start to finish, and playing for your (very lovely) ceremony really was a highlight of our week. Congratulations to the both of you, and thanks for letting us be a part of such a special event! Daniel and Rachel are simply amazing. We decided we wanted music for our wedding ceremony and reception at the last minute, so with barely a week to go before the ceremony we booked them and told them what we wanted. They where easily accessible and responsive, and because they have such a varied repertoire of music they were able to play music everybody liked, regardless of the short time they had to prepare. The sound of their music made the evening even more magical, and we have received a ton of compliments on how elegant and lovely their music was. Right after the ceremony, my mother asked them if they could play for an extra hour and they were gracious enough to stay the extra time. It was a great decision to have them at the wedding. Rachel & Daniel were the perfect addition to our outdoor wedding in September 2011. They were extremely knowledgeable, professional, communicative and supportive. They played for an hour - beginning a bit before our ceremony kicked-off and they immediately set the right tone for our event. They played during our wedding ceremony II selected more classical music for the ceremony) and then a mix of classical, folk and more modern music for our cocktail hour. I live in Boston, but our wedding was being held outside of Portland, ME. I communicated with them via email leading up to the event, they sent me some suggested music selections to choose from and offered to learn two songs at our choosing. As the day of our wedding was a bit more hectic than I thought it would be, I didn't have a chance to connect with Danile & Rachel the day of the wedding before our the event began... and I was nervous that they wouldn't know when to begin playing the music I had selected for the ceremony - and when to transition into the ceremony music (because I had planned to review this with them in person), but they have obviously done this before and transitioned everyhing just perfectly. They set themselves up, were very low key and just created the perfect atmostphere for our day. Of all the variables that need to come together in one day - they were one piece of the puzzle I just didn't have to worry about and I can't say enough good things about working with them. Driftwood Duet is simply amazing. They performed our ceremony music for our wedding by the beach on Cape Cod, and they helped make it just magical. They are so professional, flexible, and excellent musicians. Our ceremony ran nearly an hour late and they completely rolled with punches and even played the music at our cocktail hour. The music was simple, classic, and just gorgeous! THIS WAS THE BEST MONEY I EVER SPENT ! When it comes to spending money, I’m very selective. Well, OK, cheap. I spent 18 months making a decision over an engagement diamond! I was determined to contract a string duet for the wedding and engaged in the same kind of extensive research. My research focused on Driftwood for two reasons: 1) Readily accessed auditions of their product and 2) Extensive and easily reviewed repertoire. Eminently sensible presentations, yes, but not as well presented/organized as their competitors. Painlessly, we made a deal via email and a couple of conversations. Driftwood adjusted their travel schedule to insure their arrival prior to Hurricane Irene, and, DURING THE TEETH OF THE STORM ON CAPE COD, followed me through three detours to the site, wrestled the cello through 75 MPH winds, but the real payoff was yet to come. We had no electricity, no water, no food and fading daylight. As soon as Driftwood hit the first notes of Borodin’s Nocturne, our hearty crowd of 50 turned to take note. I hit the jackpot. These two are absolutely fantastic and my style is given to sarcasm, not hyperbole. Not only did they play for the service, but I had them set up for the reception. THERE IS NO WEDDING BAND in the northeast who could have held the attention and been more appreciated. My crowd was a very representative cross section of ages, lifestyles and education. THIS WAS THE BEST MONEY I EVER SPENT, and I’m VERY HARD TO PLEASE. I’m readily available for further reference via phone call or email. I was fortunate enough to be invited to a private party featuring these two talented musicians. It's one thing to sit in a huge recital hall and take in the grandeur of it all...but to sit in an intimate environment and really listen and watch these talented artists work is a rare treat. What amazing talent! I was simply transported. All my cares seem to melt away. I was truely caught up in the music. These are two very talented people. I saw these guys playing on new year's eve. they were amazing! really talented and innovative, hadn't heard stuff like that before at all, so beautiful. wow! I was privileged to hear Driftwood perform both contemporary and classical pieces in a salon setting. They clearly know their instruments, and their audiences. What struck me most was the joy, verve and energy of their music. Their sound was as if one gorgeous instrument was performing. I was visiting Cambridge and am now finding a way to bring them out West to perform. Driftwood Strings is a vibrant ensemble of top Philadelphia-area musicians specializing in classical, folk, and traditional music. Driftwood has performed at New England Conservatory's Jordan Hall, as well as for weddings, receptions, and other special events throughout Boston, New England, and beyond. Driftwood offers duets, trios, quartets, and quintets through collaborations with talented friends and colleagues. 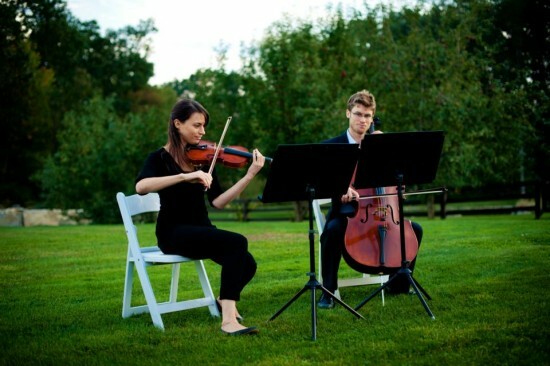 All of our musicians are graduates of top-tier conservatories in the New England area and are committed to providing beautiful, personalized music for your event.